This strip is a little different than past strips because it is based solely on Internet rumor. If you don’t like spoilers you can stop reading now and enjoy my confusing strip. If you don’t care, highlight the text below to read more. I read on the Internet that they will be changing the origin of Thor for the upcoming movie. 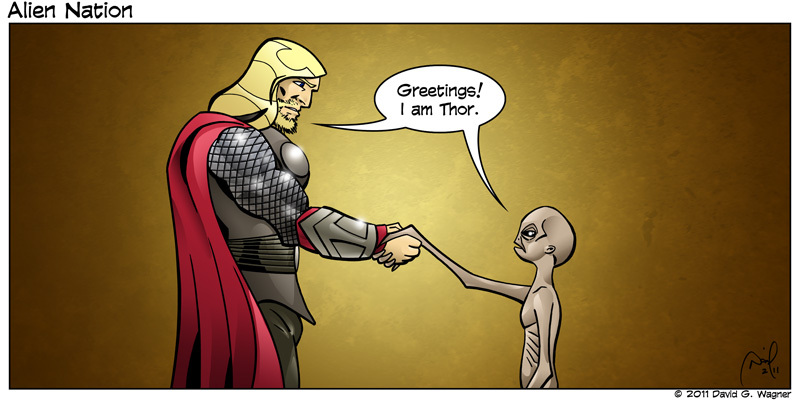 To prevent backlash from religious groups Thor and the other Asgardians will be…… ALIENS! When I read that, this strip immediately popped into my head. If you ever watched Stargate SG1 then you would understand. In SG1 all the aliens they ever encountered on the show were the basis for the gods on Earth. The Asgardians were one of the oldest alien species and were lead by Thor, a 4 foot tall, skinny, bug eyed alien. So Thor, meet Thor! It’s probably not even true but in any event this strip was fun to do. I went old school and actually inked this one with Pitt pens instead of Photoshop. I need to do that more often.